Using multiple notecards in your Movers gives a powerful advantage to the time it takes to set up for performance day. You can store up to 12 routes (12 different notecards) in each Mover and all of those routes could be independent to the Mover. You could perform an entire show without once having the dancers get off their movers! And, when used with the Spot On Performance Director HUD (with the included Stage Marker) or the Stage Manager, you can even have different starting positions for each of those Mover routes and the Movers will jump to their correct starting position when each card is loaded, every time, no matter where on the sim they are rezzed. Unless the included Stage Marker or Stage Manager is used, all mover notecards must have the same start position. Using one of these will allow any start position. USE ONLY ONE OF THESE! A dummy route has one Waypoint in the center of the Designer Ring. When that notecard is loaded, and PLAY is pressed, those Movers will stay where they are. See Backstage Mover video. Using multiple notecards in your Movers with this option gives the choreographer much more flexibility, allowing each of the routes in the Mover's notecards to have different starting positions as well as having the Performance Director load the appropriate notecards for you in the HUD and your Movers. Just by pressing the notecard name makes that routine active in the HUD and all of your Movers. 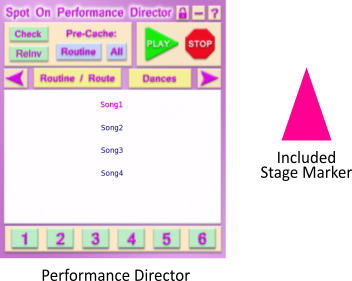 If the Stage Marker was used when creating the routes, the Movers immediately go to the appropriate start position for the active routine. The names of the Mover's notecards need to match the names of the performances in the Performance Director HUD. One stage marker must be rezzed in a fixed position during the GETNOTECARD stage when designing your routes. Learn more about using the powerful Performance Director HUD and its included Stage Marker. For rezzing sets and props in all of your venues, see the very powerful Stage Manager. You can have Movers rez with your sets, in perfect start position, at every venue you perform. Set up your entire set at your build site, then pack it up to go. Stage Manager must be rezzed when you GETNOTECARD with your movers. Do no use Stage Manager and Stage Marker at the same time! Read and learn about the Stage Manager, made for traveling pros! YOU must be sitting ON a mover for the Notecard Menu (second button) to work! the Spot On Choreography Quick HUD to bring up the notecard menu.